Ron and Maria Pedersen believe homeowners associations help protect home values, but when their HOA board denied a request for an above-ground pool, they felt their association was doing more to hurt the community than enhance it. The Sierra Verde couple erected an above-ground pool each summer for the past six years and did not hear any complaints -- from neighbors or the board -- until they received a violation letter for their new 22-by-14-foot pool this summer, they said. The denial was based on the pool being visible through the backyard view fencing in the 1,758-home community northwest of 67th Avenue and Beardsley Road. The HOA board in July approved a new rule prohibiting above-ground pools, strengthening Sierra Verde's Covenants, Conditions and Restrictions approved in 1995. Exhibit B of the CC&Rs requires architectural committee sign-off for pools in view lots but does not specifically reference above-ground pools. While the Pedersens work hard to keep their backyard neatly manicured and understand the need for guidelines, they said awareness of a blanket prohibition of above-ground pools would have factored into their purchase of a view lot in Sierra Verde. Sierra Verde residents Ron and Maria Pedersen are disappointed their HOA denied an above-ground pool because their backyard has view fencing. They have three children, from left, Ronnie, Matthew and Alison. "I feel like they're taking our pool away from our kids," Mrs. Pedersen said. "This summer's over but we're fighting for next summer and the summers after that." "We looked through the CC&Rs and it said nothing about having an above-ground pool," Mr. Pedersen said. "That's why we came into this neighborhood because we thought it was a family neighborhood." Rather than promoting a family-oriented community, Mr. Pedersen said the HOA is doing the opposite. "I don't see their argument at all that being so stringent is going to help property values," he said. The Pedersens were discouraged for their three children after going through the official process for approval and being denied twice. 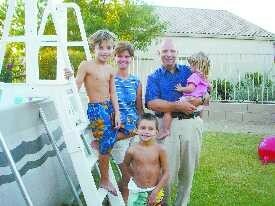 "We just love our pool so much, I think it's worth fighting for," Mrs. Pedersen said. "We're not doing this to bash the HOA or anything. We really feel this is going a little bit too far." After receiving a violation notice this summer, the Sierra Verde couple filed a request with the HOA architectural committee. When the three-member committee denied the request, they appealed to the HOA board, which notified them of denial in a Sept. 2 letter. The Pedersens offered to plant more bushes in front of the view fencing to hide the pool, which is on the far side of their yard. They told the board they would store the pool in their garage eight months out of the year but got the impression board members expected them to buy an in-ground pool. "It's a big financial burden for us," Mr. Pedersen said. "To me, that was the only option they gave us -- 'when are you going to get an in-ground pool?'" Two board members, including the board's liaison to the architectural committee, declined to discuss the case. Board members willing to comment on the decision said homeowners who live on view lots face more restrictions in the name of aesthetics than those with backyards that cannot be viewed by passers-by. Board Vice President Ed Nyberg said many residents move into view lots and spend a lot of time trying to get around the extra guidelines. "You have to try to be as consistent in the application of the rules as possible," he said. The architectural committee, which also oversees landscaping changes and room additions, has "discretion" authority to decide the norm for view lots would be in-ground pools, explained HOA Board President Carey Crabbs. She said incoming homeowners should consider they will have less privacy and more restrictions if they choose a view lot. "I would hope the majority of them would review the documents," she said. The board cited the new community handbook rule that prohibits above-ground pools and restricts above-ground spas. Under the "Pool and Spas" section, above-ground spas must match the home's primary color or be screened by a stucco wall painted to match the home. The 37-page community handbook lists a myriad of rules, such as ground-mounting satellite dishes and painting basketball hoops to match the home exterior. It includes new resolutions passed by the board and further clarifies subjects in the CC&Rs, such as defining overnight parking, Ms. Crabbs said. It also explains how to request architectural committee review and the appeal process. The handbook was discussed during a board workshop and approved July 26. The Pedersens, along with the rest of the community, will receive a CD with the new handbook rules in the mail this month or next. The couple said aside from this disagreement, they have enjoyed living in the community for seven years and plan to attend the Nov. 8 annual meeting. Mrs. Pedersen said the large backyard was a plus to buy her house. She said their lot's location is not a high-traffic area and noted 10 immediate neighbors signed a petition expressing no objection to the pool. The family began with kiddie pools and graduated to larger pools, such as one 3-feet high, to keep up with their children's growth spurts. With a locking ladder on their current 4-foot high pool, they can keep their 2-year-old daughter safe from the water without erecting a fence. "I care about these guys, I want them to have some fun," Mr. Pedersen said. "It gives them something to do; otherwise, they're stuck in the house getting no exercise."